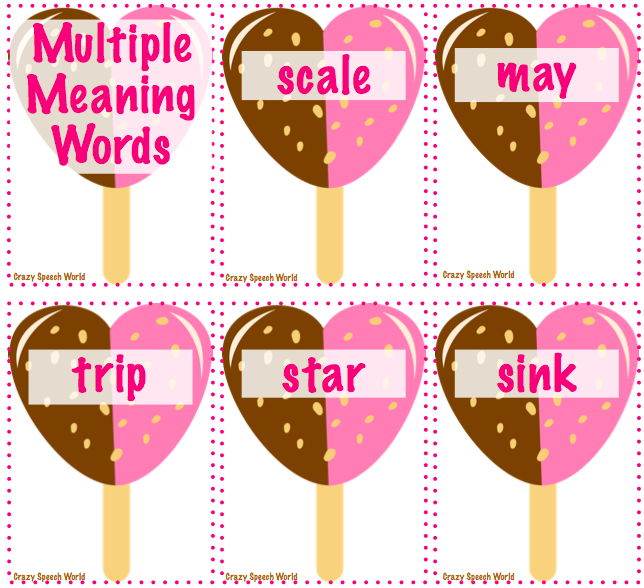 Speechie Freebies: Multiple Meaning Heart Pops! Hi Speechies!!! So happy that you have found your way here! My name is Jenn and I write the blog Crazy Speech World. I am a SLP in Florida, working with students PK-8th grade. I love doing crafty speech therapy, using literacy based interventions, finding new iPad therapy apps, making fun materials for my kiddos and sharing it all with my readers! I am SO excited to be a collaborator with Speechie Freebies! 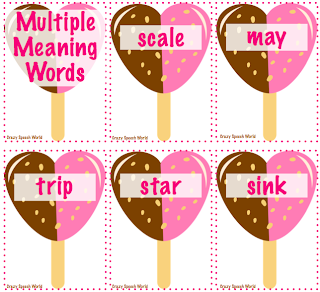 I am always needing fun ways to address vocabulary, especially multiple meaning words! This skill is so important for comprehension, which is often a challenge with students who have language disorders. Pop (ha!) on over to Crazy Speech World to grab this freebie!